Facebook, while being a great social network, is a great photo-sharing network too. We people love to click photos, create photo albums of our memorable moments and upload them on Facebook to share with our friends. Facebook also provides great features to share photos and albums effectively. You can tag friends to relevant images, view photos either in simple photo-viewer of lightbox photo viewer that generally appears whenever you clicks a photo. Even if a Facebook user is not habitual to share its pic, he at least have profile pic on his/her Facebook timeline. According to a study, it has been found that our Facebook, Twitter or any other social network profiles are much dependent to our friends at that social network than our own’s nature. So, its time to credit those awesome friends for your presence in that social media network. How to do that? Well, what about the idea of creating a beautiful photo mosaic of your Facebook and Twitter friends? See the image below. So friends, if you like the idea and want to create one similar photo mosaic for you then Frintr is available. According to Frintr, your profile picture is made from all of your friends. 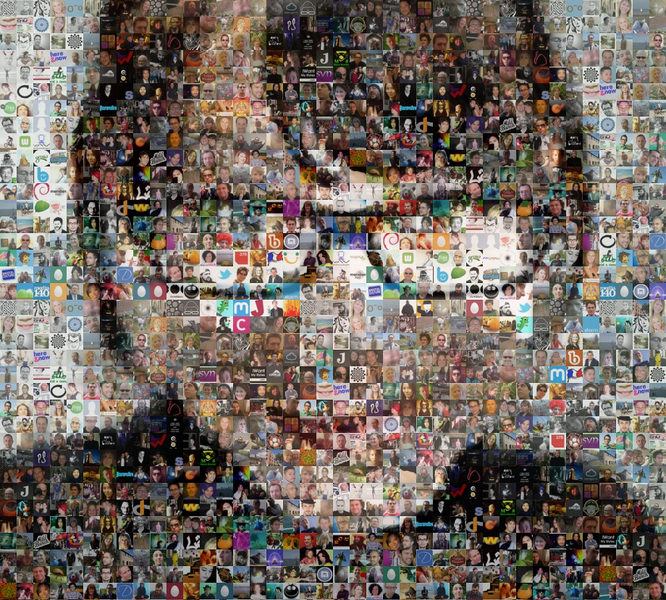 So, the service lets you to create awesome photo mosaic (frint) of your friends at Facebook as well as Twitter. Not only this, Frintr also lets you create similar photo mosaic for any twitter search by collecting profile picture of twitter profiles that appears in search results incase, if you’re interested in creating frint of the people who have mentioned that particular term in the last week or so. reating frint from Frintr is very easy. For creating photo mosaic from your Facebook, Twitter profile, all you need to do is log-in Frintr from your Facebook or Twitter profile and authorize the Frintr app. The service will automatically start fetching profile pics of your friends and create photo mosaic of your profile picture using them. If you want to use any other image instead of your profile pic, you can use that too. For Twitter search, just enter the search a popular search term, specify the image for which Frintr is required to create photo mosaic and the service will do all the remaining task.